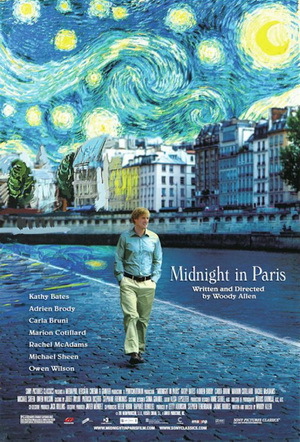 Midnight in Paris is a comedy directed by Woody Allen starring Owen Wilson. The film is an ode to Francophiles and really anyone who yearns for the glimmer of yesteryear. Wilson plays Gil, an unfulfilled Hollywood screenwriter who is on a Parisian vacation with his fiancée Inez and her family. (I assume that pre-wedding honeymoons are a common occurrence for Hollywood types and successful job creators, but I digress.) Gil wishes to move to Paris and rekindle the creative spirit of his youth, while Inez would much rather him stay in his current job where he is comfortable; such are the trials and tribulations of the artist! (Pronounced ARE-TEEEESTE; we are in Paris after all.) Feeling out of touch, Gil takes strolls by himself on the streets of Paris, and finds a carriage that takes him back to 1920’s Paris; his ideal Paris. Through his quantum leaps he finds himself in the company of many literary and art figures that inspired him: Ernest Hemmingway, Cole Porter, Gertrude Stein and Pablo Picasso among them. Gil’s nights in the past bring him a lot more joy than his days in the present, but he arrives at the point where many protagonists often ask themselves: can I actually live in a fantasy? There are two different Owen Wilsons: The over-the-top Owen Wilson of films like You, Me and Dupree, and the more subtle Owen Wilson from Wes Anderson films such as The Life Aquatic with Steve Zissou. Thankfully the latter Owen Wilson is present in Midnight in Paris. Gil’s unfettered joy at meeting literary icons makes his character so much fun. During the daytime he looks like the cat that ate the canary, spewing historical facts that he learned the night before. Marion Collitard plays romantic interest Adriana. Collitard is always great to watch on screen; she exudes a classic Hollywood look and confidence. As Adrianna she plays the latest in a long line of Woody Allen beauties that has the power to make you root for the protagonist to have an affair with. There are also plenty of cameos by various actors: Kathy Bates as Gertrude Stein, Rachel McAdams as fiancée Inez, Michael Sheen as the perfect know-it-all romantic foil and Adrian Brody in his brief but amusing take on Salvador Dali. There’s a great mise-en-scène to the film, (and yes I can use snooty French film terms; the movie’s about Paris!) The music provided by Stephane Wrembal is an essential piece of the film, bringing the style of the 20’s and the humor of Gil’s predicament to life. The dimly-lit, smoke-filled cocktail lounges that populate Gil’s late nights in the 1920’s firmly contrast the golden brightness that the Paris daylight brings in 2010. Midnight in Paris is a film that questions if the grass is actually greener, specifically when it comes to days gone by. Can an overreliance on nostalgia become a form of escapism? (There’s a meta-joke about escapism being explored in film: one of the ultimate forms of escapism, but I can’t put my finger on it.) Whatever the answer is, Woody Allen has a fun time exploring the question and I would advise not to think too hard on it (or about the potential damage Gil makes to the space-time continuum!) and enjoy the ride. 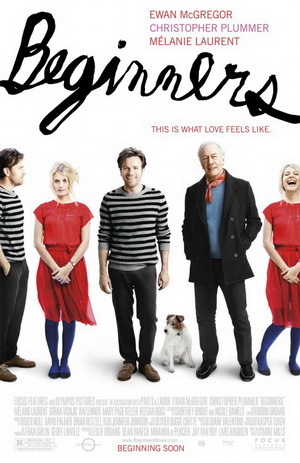 Beginners is a film based on director Mike Mills’ experiences with his father coming out of the closet as an elderly man. It stars Ewan McGregor as Oliver, who at the start of the film is dealing with the death of his father Hal (Christopher Plummer.) As Oliver is dealing with the responsibilities of closing his father’s affairs, he meets Anna (Mélanie Laurent, Inglorious Basterds.) The two begin a casual relationship and Oliver quickly falls in love with her. The romance is intercut with flashbacks of Oliver’s childhood relationships with both of his parents and his adult relationship with his father. After Oliver’s mother died, his father came out of the closet, and we see how Hal embraced and enjoyed his true nature at the end of his life. As the film progresses, we see how Oliver’s parents’ relationship affects and shapes his own relationship with Anna; and why he is so cautious to commit. One of my favorite aspects of the film is its unique visual narration. Much of the film is narrated by Oliver and is based on his memories and thought processes. We are frequently shown a slideshow of images and history as a representation of his memory, which I loved. Oliver is obviously conscious of history and the differences among generations. He discusses the cultural climate and norms of his parents’ relationship, and contrasts it to that of his own relationship in the present (2003.) When Oliver meets Anna at a costume party, it is clearly no mistake that he is dressed as Sigmund Freud. I’m not going to bore you (or myself) with any detailed pseudo-psycho-analysis, but it is obvious a lot of aspects of Oliver’s relationship with Anna mirror his own mother. Another unconventional aspect of the film is the character of Arthur, Hal’s dog. After Hal passes, Arthur is under Oliver’s care and takes him everywhere he goes. At several points in the movie Oliver speaks to Arthur, who replies in subtitles; there is no explanation for this, which I also loved. Ewan McGregor carries the film as the emotional anchor. He does a great job at conveying Oliver’s uncertainty of love and plays a good straight man of sorts to Plummer. Mélanie Laurent plays the role of “free-spirited love interest” well enough without flying off the handle and becoming farce, (If you haven’t seen Inglorious Basterds, I would recommend it simply for Laurent’s role.) Christopher Plummer steals the show, which is essential for the role he portrays. Even as Hal knowingly faces a death of cancer, we see him living a life full of joy. It’s invigorating to see a character that doesn’t let old age or cancer stand in the way of his happiness. The only drawback of the film is Oliver and Anna’s relationship, surprisingly. After a while I found myself bored with the pair and would much rather see some more father/son interaction. Though it’s a minor setback, and doesn’t make their love story any less interesting. The greatest part of this particular love story however, is its reliance on family and the way that they shape one’s beliefs, expectations and fears of love. Beginners is a story about a boy and a girl, certainly; but it is more importantly a love letter to fathers (and to a lesser degree, mothers): fictional and real. The Descendants is an excellent depiction of family relationships; along with the impact tragedy has upon them and the humor that often arises from it. George Clooney plays Matt King, a frugal father and lawyer who is the sole trustee of a large inherited plot of land on the Hawaiian island of Kauai. As the family is nearing a close on selling the land, Matt’s wife Elizabeth is in a boating accident and is put in a coma. Matt, who describes himself as a “back-up-parent,” now must shoulder the responsibility of raising two daughters: Scottie, 10 and Alex, 17. Scottie responds to her mother’s state by acting out at school. Alex (Shailene Woodley) is away at boarding school and could seemingly care less. When Matt finds out that Elizabeth will never wake up from her coma and they must pull the plug, he gathers Scottie, Alex and boyfriend Sid to break the news to the family. On the journey Alex reveals that before the accident her mother had been cheating on Matt, and planned on leaving him. Despite this news, Matt soldiers on in his mission. In the process he receives a verbal lashing from his father-in-law, who blames Matt’s lack of attention for his daughter’s death. Later on, Matt decides to face the man who made a cuckold out of him (played by Matthew Lillard,) before his wife’s passing. The end of the film is a sweet goodbye to his wife and a step in a new direction for his family; in terms of Matt’s inheritance and his relationship with his children. On the surface, The Descendants is about a family who has the rug pulled from underneath them and must find their footing once more. Dig a little deeper and it is a film about defying expectations; both in and outside of the story. The King family is relying on Matt to sell their inherited land, making them all very wealthy. Ultimately he has to ignore what is expected of him and make the decision that he feels is right. Likewise, it seems we as viewers have an innate desire to see our protagonists get their just deserts; after all, this is fantasy. In that respect, Matt defies audience expectations in the way that he addresses his wife’s adultery. Of course he is devastated, but he doesn’t use that pain as an excuse to tarnish his family’s pristine image of his wife. Clooney’s Matt has multiple opportunities to fire back at his father-in-law’s personal attacks, but he doesn’t; he instead allows a father to remember his daughter the way he should. The way Matt handles the entire situation is a true testament to his love for his passing wife; just because his world is shattered doesn’t mean everyone else’s needs to be. Bottom Line: You should probably see The Descendants if you haven’t already. It’s a great movie about the strength of a family and the difficulty of doing right by them. As I gradually wrap my brain around how to finish my current short story, A Slow Death in Vienna, I have decided to start writing more movie reviews; as a way to stretch my tender writing muscles. Since it is nearly Oscar season, I find it highly appropriate to start with some nominee hopefuls. When it comes to the Oscars, its a safe bet on what films will garner SOME sort of nomination. With that in mind, I have a rough list of what I want to watch before The 84th Academy Awards on February 26th. I want to be fully prepared this year for the Oscars; as my good friends and I shall be throwing down some Washingtons and MAYBE even some Lincolns, betting on the annual awards show. 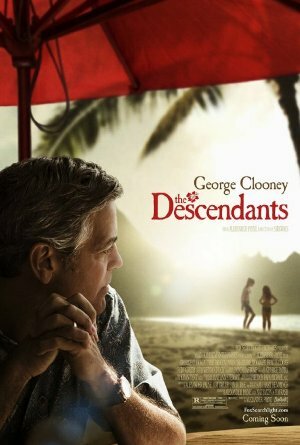 Over my vacation I saw The Descendants, which shall be my first “Oscarific” review. Other films that I will definitely see and review are Midnight In Paris and The Tree of Life. My Week With Marylin, Beginners, Hugo, The Help and The Artist are also on my rough list of things to see. And hopefully sometime in between all of that I will finish my story!